Trusting the economy again can be hard for buyers looking for home ownership. There is no better time than the present to save money on a mortgage. The future is not guaranteed, but the present interest rates are at an all time low. Interest rates translate into lower pay back amounts which result in monthly savings for homeowners. Unfortunately, many buyers are hesitant to purchase because of large down payments which were once required. Things have changed; low down payments and zero down payment is available to new purchasers. This is a tremendous help to families – saving out of pocket expenses. Most professionals in the real estate market have seen growth since the end of 2011. The market has not fully recovered; however, growth has begun at a sound rate. The financial crisis as it pertains to the housing market is no longer on a downward spin. This is wonderful news for new home buyers. Another benefit to buyers is the value of home buying. Buying a home is now more affordable than in recent years. Buyers want to take advantage of the savings, but with thoughts of large down payments how can they? Twenty percent down is a lot of money for the median home value and most people do not have this much money saved in their bank accounts. There are three mortgage types that work well for these buyers – FHA, VA lending, and USDA mortgages. An FHA is a loan type that is insured by the Federal Housing Administration. 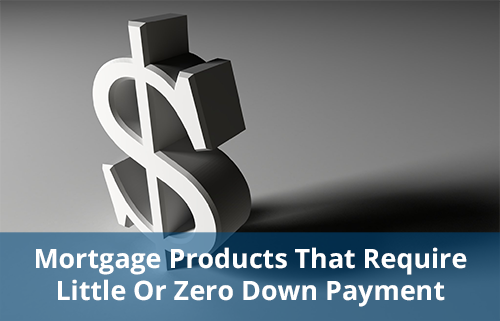 The FHA provides guidelines for lenders including required credit scores and down payments. Their guidelines are not as strict as traditional (conventional) lending (which requires higher credit scores and larger down payments). In fact, an FHA insured loan may allow borrowers with low credit scores with detailed explanation. An FHA loan requires a borrower to put down 3.5%. 500 is the minimum credit score. The mortgage insurance for the year must be paid at closing. Through FHA there is a realistic hope of taking advantage of the affordable housing opportunities that are currently available. Thanks to VA loans men and women who serve in the military are able to obtain loans without a down payment. As with FHA loans the Veterans Administration is the insurer of the loans. A VA loan allows irregular occupancy of the dwelling, credit problems such as bankruptcy, and mortgage insurance is not required for closing. Military personnel are able to save thousands of out of pocket dollars by applying for a VA loan. USDA loan is similar to the VA loan. The financing is 100%; there is no need for down payment. So how does one get qualified for this type of loan? USDA loans are location specific (neighborhood and income). Specifically, a USDA loan is geared toward low to moderate income homes. Rural areas are also another focus of USDA loans. A great benefit to getting approved for a USDA loan is financing repairs. The cost of these projects are included in the loan. Like a VA loan insurance is paid monthly. If a buyer can get approved for a USDA loan they will find some of the lowest rates. Borrowers who do not meet the qualification for these loans are still able to obtain a low down payment mortgage. 5% down payments are accepted by Fannie Mae and Freddie Mac. Unfortunately, the down payment cannot be gifted to the borrower unless at least 20 percent is gifted.